Please contact Time Clocks USA for any additional questions or assistance at 800-605-7308. 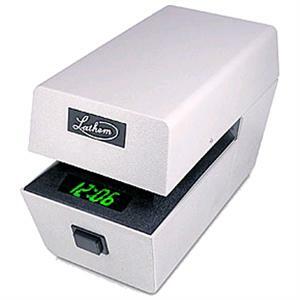 The Lathem LTTC Mecanical Time and Date Stamp is great for imprinting a variet of time, date and message (with die plates) combinations. Never again be at a loss as to when thing are occurring in you business. The LTTC time and Date Stamp provides an effcient, cost effective way to register time and date on your important documents. These stamps allow for quick recording of date and time on all your business forms from onion skin to 1/4 " thick. The LTTC allows for the addition of upper and/or lower die palates for static text to be included with each numbedr stamp. Die plates can be purchased separately and can be included with the numbering stamp per-installed (allow extra time for deliver, whether pre-installed or not, die plates can take up to three weeks for delivery). Text (or die) plates can have up to 3 lines of text above or below the number imprint (19 characters per line including spaces). Dimensions: 7" x 5.5 x 11"